As you all know that previously, the Staff Selection Commission has canceled the SSC Multitasking Staff Exam 2017. Accordingly, the Commission has decided to conduct the re-exam from 16th September to 31st October 2017. 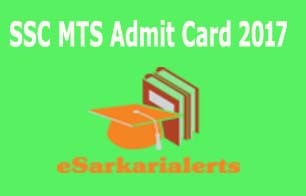 The SSC MTS Admit Card is available for all regions. To get the direct link for the hall ticket, put your eyes on the link table that is given in the last segment of this article. Dear candidates, your search for the SSC MTS Admit Card 2017 ends here. If you are finding the same then here we are going to account for the essential facts regarding this admit card. The Staff Selection Commission is all set to regulate the SSC MTS Exam 2017. We know that a great figure of candidates is cataloged for this examination. Newly, those contenders are eagerly looking for the SSC MTS Exam Admit Card. As per the latest details, the organization has released the admit cards of this test. Downloading of this admit card is very easy by considering the details of this page. So, put your eyes on these details and get your admit card easily. When we talk about any kind of examination we come to know that it is most important part of that exam. If any participant declines to bring the hall ticket in the examination room then his/her entry in that exam will be restricted by the organizing body. Therefore, the appearing contenders are advised to download the Staff Selection Commission MTS Admit Card before they go in the exam. The authority will conduct this exam on three various dates as mentioned on this page. Latest News About SSC MTS Admit Card 2017: The Staff Selection Commission has made few changes in the date of examination which are described below on this page. Moreover, the admit cards of this exam are now available for few regions. So, you can download your hall ticket from this page and for other news about this admit card, you need to stay in touch with us. In the starting of January 2017, the Staff Selection Commission has opened good news for all job hunters. The organization described a notification of jobs which is known as SSC MTS Recruitment 2017. Under this job advertisement, the authority detailed total 8300 vacant positions of Multitasking Staff in various government recognized departments. As each SSC Notification, around seventy lakh job seekers took part in the online registration process that was ended on 03-February-2017. With the completion of registrations, the applicants are looking here and there for their SSC MTS Hall Ticket 2017. Such candidates can collect the call letters for the examination. So, you will be known that how vital is SSC Multitasking Exam Hall Ticket to appear in the SSC Multitasking Exam? To download it quickly, you need to stay updated with us because we are getting the latest updates of this admit card and as it issues we will provide a link to download the hall ticket directly. So, candidates don’t forget to check this page regularly. And also take a look at the steps to download the multitasking admit card in just seconds. The Staff Selection Commission is mainly recognized as SSC. The SSC works for the recruitment of suitable contenders on various vacancies in different division under the central and state government. This time, the latest notifications of recruitment is revealed by the organization to hire the talented suitors on above-stated posts. To forward this selection procedure, the department is going to conduct an examination on respectively 16 April, 30 April and 07 May 2017. Before ten or fifteen days of examination, the authorization will release the SSC Multitasking Staff Call Letter 2017 for all appearing runners. We have discussed the importance of the admit card in above section but it has another importance. It contains many essential particulars pertaining to the candidate such as roll number, exam date and shift, venue of exam and further details about an applicant. Thus, it is most important that the candidates download the SSC MTS Call Letter 2017. Also keep two or three copies of it. At the beginning, in your internet browser open the website of SSC viz. “www.ssc.nic.in”. On the homepage, you will see a link which is named “admit card”. A list of regional websites will be opened in the front of you. You have to click on the link which is for your region. After reaching on that web portal, click on this admit card link. Fill the asked details such as your “registration number”, “date of birth” and etc. Submit the proper details otherwise, you will misplace your hall ticket. Hit the “submit” or “get admit card” button. Your call letter will be visible on the screen of your personal system. Lastly, save this admit card and also take two printouts of it for the examination use. Dear applicants, now, you can download the SSC MTS Admit Card 2017 easily according to the above steps. If you have any problem in this process then you can get its solution by putting your comment in the following comment box.